Standard saws like this were very popular a few years back. They only do basic straight and mitre cuts so when the compound version of this came out it quickly became the most popular. These days the price difference is so small that most people will simply buy a compound saw. Now you don’t have to, but for an extra few pounds I would recommend that you do, simply because you can just do about any project around the home if you own one. These are often referred to as chop saws or drop saws. However a mitre saw and a chop saw are not quite the same thing. It is a term that is often confused by so many people. That is totally the fault of people in the construction industry who are casual in their approach to describing saws. A chop saw or drop saw will simply do a basic 90 degree cut and that is all it will do. It can not cut a mitre joint. The term “chop” was introduced as a trendy word for a quick cut. You could of course do this with a mitre saw or a circular saw but that as you can see, is not the only purpose of a mitre or compound saw. Hopefully that clears up an often confusing and misused term. This is the most basic of all of the mitre range and it simply makes straight cross cuts and different angles of mitre joints. So many people are persuaded to buy either compound or sliding saws that in all honesty they simply don’t need. We have used this type of saw to lay floorboards, work on skirtings, fit kitchens, make fences and gates and just about anything else you can think of. So it is certainly possible to buy and use a basic saw like this. It is hard to find a basic saw these days so something like the Makita MLS 100 is just about perfect for this type of work and it is something that will last for many years to come. This is also a compound saw so that will open up the range of work that you can do. What we would say is that many professional contractors would be limited by having a saw like this, and for people who like to do a lot of woodworking, this type of mitre saw certainly has its limitations. That said, your typical DIY person will only ever require to own one of these types of saw. We would also advise against getting drawn in to the arguments made by the “so called experts” who make strong arguments for buying compound or sliding saws. The best way to think of this is to compare this purchase to buying a coffee machine. Cafes who churn out hundreds of cups a day will need a different machine to the one we may need at home, which may only be used a couple of times a day. For certain the one in the cafe will have more bells and whistles but at the end of the day, they both just make a cup of coffee. Our advice is buy for your needs, rather than buy based on the advice of some mitre saw addict, who believes that everyone needs to cut complex doubled angled mitre joints. For me a good compound saw at around £100 is the best investment for almost all people. It is a fact, and one that is almost always over looked that these saws take up room. Simply because of their design, and they way in which they are used, there is no real way of being able to save much space. A typical standard saw of this basic type will measure around 60 cm (24″) in width, depth and height. So wherever you plan on using this and storing it you will need to allow this type of room. If you plan on using this in the garage or workshop, then you also have to make sure that it is easy to access. If you are going to be cutting a 10 feet lengths of skirting board, then you need to have your saw located so as the wood can be accommodated. A basic saw like this will weigh around 10-15 Kg (About 20-30 lbs) so again you should take this into consideration. Most people will want to be able to bring their saw to the location where they are working. We appreciate that this is not too heavy, but if working for long periods, you would not want to have to move it around too much. Watch out for this. On many saws, you may have a lot of dismantling to do, should you need to change a blade. Some of the better quality saws make this process a great deal simpler, by only having to loosen a single screw to remove the blade guard and give you access to the bolt that holds the blade in place. 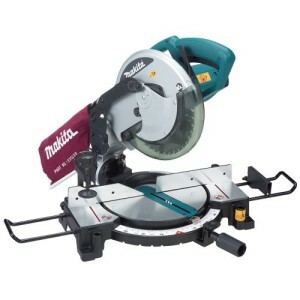 Any basic mitre saw will have pre-sets so it is really all about having accurate pre-sets. Even a small variance of one degree can produce some really unsightly work. We would advise that when you are setting up your saw, that it is really useful to check these using a simple square. Make sure that whatever one you buy has some way of gathering up the large amount of dust that these saws will create. You most certainly do not want this left sitting around, and you really do not want it getting into your eyes, ears and lungs. A simple bag should be enough for most people. You can read a full article on dust extraction by clicking here. Other than the features that we have described, you are essentially looking for a well made saw, that looks good to the eye and is really well constructed.